Every cottage home collection needs a special cabinet like our Amish Pine Deluxe Jelly Cabinet. 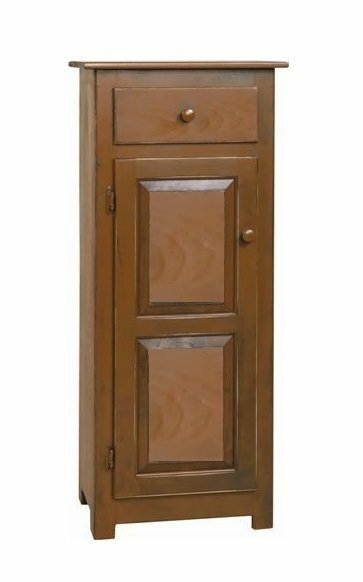 The appeal of the Amish Jelly Cabinet has never gone out of style and allows you to enhance your American made furniture collection with an antique look. Complete with two adjustable shelves inside, solid pine wood drawer boxes and pine knobs, this Pine Deluxe Jelly Cabinet adds warmth and charm to your cottage style or country kitchen. Use for storage, display or both! Our Amish pine furniture is handcrafted to reflect your personal style. This Country Farmhouse Jelly Cabinet is Amish handcrafted from Eastern White Pine Wood. This wood is a more economic alternative to other woods, allowing you to furnish with solid wood furniture at a lesser cost. We offer a wide variety of Amish pie safes and Amish jelly cabinets that are all handcrafted for each customer but look like antique reproduction pieces.